8 painted wooden cubes in a wooden box with a lid. The box is hinged and opens out to display the cubes. The lid is printed with the binomial square pattern. All the blocks fit into a natural wood box. Each side of the cube has the same dimensions and pattern, and represents the square of (a + b). The faces of the small blocks are color coded: a2 is always red, b2 is always blue, and "ab" is always black. The child takes the cube apart beginning with b3 and lays out the pieces as shown, according to the formula. The child reconstructs the cube, matching red faces, black faces, and blue faces, beginning with a3. The Directress shows the child how to carry the box to the table. 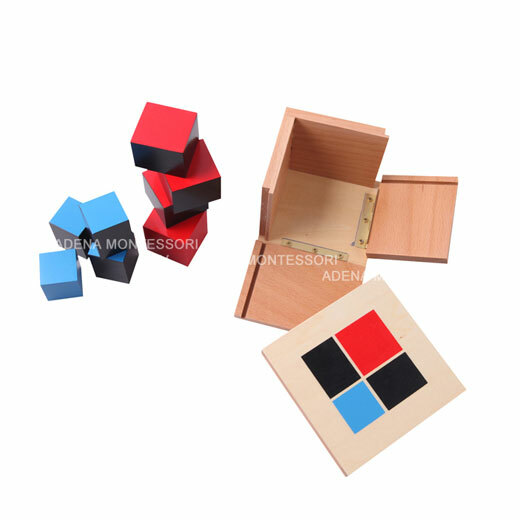 She sits besides the child, open up the box and lays out the blocks in the following pattern that will make it easy for rebuilding the cube in two layers. The Directress then shows the child how to rebuild the cube. The colors printed on the lid act as a guide. The cube can not be built if incorrectly assembled. One way that humans attempt to survive is by understanding the world around them. The human brain is a pattern seeking organism. So, by nature, children are interested in finding patterns, relationships, and order. If children have worked their way through the materials for dimension, color, and shape, they will have found order, patterns, and relationships in those materials, and will have developed the ability to discriminate attributes to a point where they will enjoy the challenge of exploring the order inherent in the binomial and trinomial cubes. For this age, the purpose of the material is not to teach math, but instead, to provide a challenge for a child's ability to find patterns and relationships. Therefore, the material is presented as a sensorial activity. It is presented like a three dimensional puzzle. Anyone who likes to do puzzles knows that in order to master a puzzle, you have to pay attention to the relationship between the pieces. People who are masters at puzzles will tell you that they take out, and organize, puzzle pieces very carefully. This is what is modeled for the child in this activity. Purchasing this will earn you 23 rewards points!